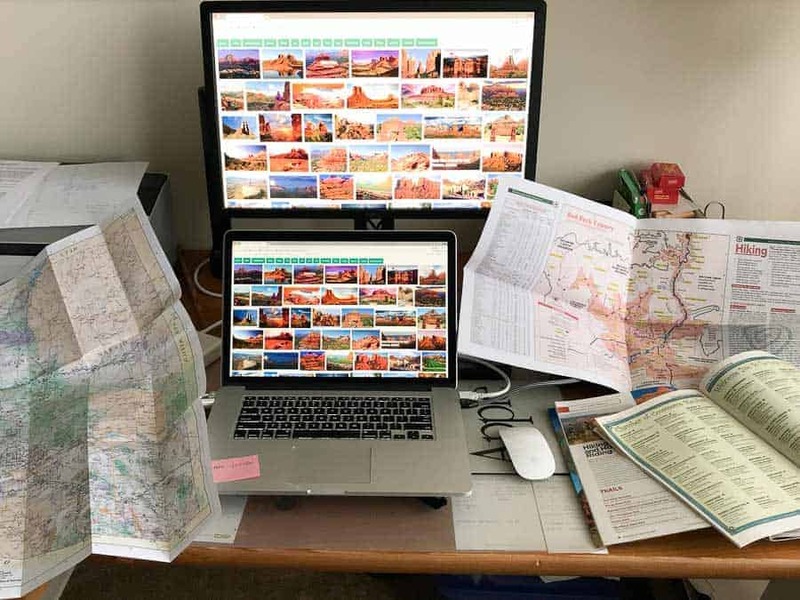 Planning a trip can be messy! You have a business trip coming up and you want to take advantage of being in a new town by planning some photography while you’re there. Who knows if you’ll ever get back, so how do you maximize your limited photography time, find the best locations and come back with images you’ll be proud of? For quite a while, I was a road warrior, traveling frequently enough to earn gold status with airlines, hotels and car rental agencies. While the glamor of travel evaporated many years ago and while the flying experience can be a real grind, being in a new city gives you the opportunity to exercise your photographic creativity with new subjects, in a different atmosphere and under unique lighting. As I write this, I’m researching a trip to Santa Fe, NM, and I’ll be using examples from my planning process to illustrate this article. A business trip probably isn't the time to bring every piece of gear you own, so careful planning around what you want to photograph, what gear you take, and how you pack will pay dividends when you're lugging everything not just through airports but also through the streets of your destination. Recently Nathan Goldberg gave some helpful tips for getting your camera gear through security at airports. And, earlier this year Tracy Munson published a “shot list” with some great ideas to help keep your travel photography fresh. Whenever I was headed for a new place on business, I always checked to see if I could stay an extra day or two. Maybe the meeting was on a Monday and I could fly in on Saturday and have part of that day and all of Sunday to explore. Maybe the meetings ended on Friday afternoon and I could stay over the weekend. Often, flying on weekends was less expensive than on a Monday or Friday, so I’d save my organization money and I’d get to shoot a new locale for the cost of a night or two at a hotel and, perhaps, a rental car. That’s a win-win situation! If your company is sending you to a once-in-a-lifetime destination, it may also be worth taking a vacation day or two to get more time to explore, particularly if you think you might never be back there again. I was never sent overseas to a city like Paris but, if I had been, you can bet I'd have taken some vacation days to explore and photograph! Because business meetings are generally during the daytime, you can often be out shooting a sunrise or sunset, or shooting the city skyline at twilight. For street photographers, the city comes alive in the evenings. And there are many interesting compositions as the city wakes up in the early morning hours. Be smart and use your free time effectively! So, now that you’ve maximized the amount of free time you have on your business trip, let’s plan to make the most of it. Making the best use of your free time requires three things: planning, planning and planning. A dose of flexibility and a pinch of luck also help, but doing the research and making some serious plans will set you up for success. Typically, I’ll start with the two easiest bits of research. First, I’ll check the Really Good Photo Spots (rGPS) app. I’ll just type in the location, “Santa Fe”, and see what comes up. Locations are submitted by other photographers, are vetted by the Improve Photography people, have GPS location data, and can direct you to the exact spot. How easy is that? Next, I’ll take advantage of the collective knowledge of the Improve Photography community by asking for recommendations on the Improve Photography Podcast Facebook Group. The Group has people from all over the world and you’ll often find someone who lives in or near your destination. They’re often full of local photography knowledge and happy to share. I had my first responses within minutes of posting my questions about Santa Fe. If you’re not familiar with the city, start your detailed search by looking at tourist sites. For instance, I Googled the “top ten things to do in Santa Fe.” If you have any specific interests, like historic buildings, waterfronts or bridges, there are websites for them, too. Santa Fe is rebuilding its waterfront along the Santa Fe River with an extended park, public artworks and walking/biking trails. This could be a fun area to wander through with a camera. I also learned about the Randall Davey Audubon Center and Sanctuary, a great place to go to photograph birds of the southwest. You’d need a car (or taxi) as it’s on the outskirts of town. The Sanctuary is home to upwards of 190 bird species, depending on the time of year! Depending on your interests, you may want to look up where the business district, restaurant row, historic district, art museum, city parks and galleries are. These sites can be great for people watching, street photography, vignettes of life, and architectural shots. I like to Google photography tours in the city I'll be visiting and see what’s on offer. Sometimes the descriptions of the tours give me ideas. Sometimes I find a walking photo tour that fits my interests and schedule and will sign up for it. If you’re part of an existing Meetup group, search for photography Meetup groups in the area you will be visiting. A list of their past events can give you some ideas. You might also try contacting the group leaders. I’m one of the organizers of a North American Nature Photographers Association Meetup Group for the Washington, DC area and we occasionally get inquiries from travelers looking for ideas. In Google Maps, there’s a very useful feature not everyone knows about. 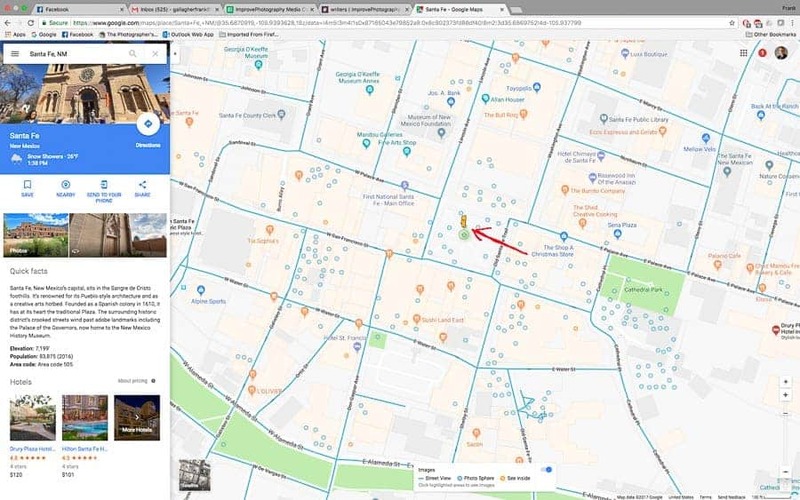 If you zoom in on a map, as I have here with downtown Santa Fe, you can select (click and drag) the little yellow figure (see red arrow in image). Immediately, a bunch of small green circles appear on the map. Drop the little figure onto one of the circles and you’ll get a photographic image from that spot, often a “street view” 360-degree image. It’s a great way to explore a city before you go there! Moving the little yellow figure (see red arrow) shows you where others have taken pictures. Street view from Santa Fe Plaza, where I dropped the little yellow figure on the map (see inset). You can have a similar experience using other sites. For example, 500px has a map feature where geotagged photos are superimposed onto a map. 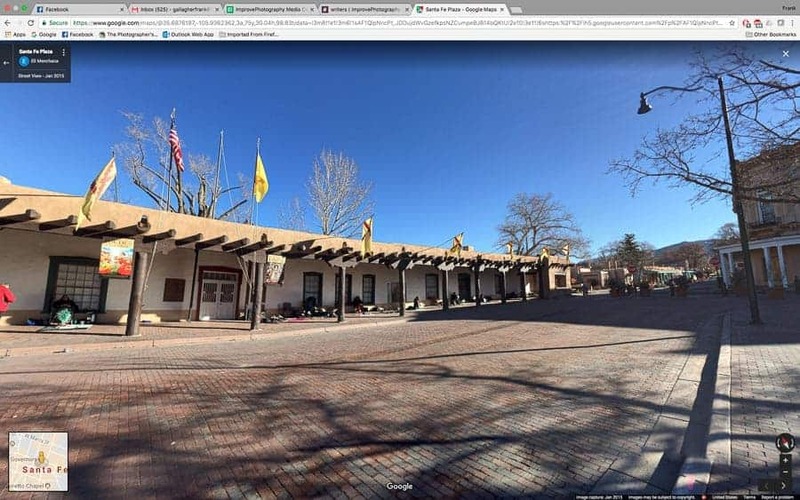 With both Google Maps and 500px maps, a large cluster of photos, such as those around Santa Fe Plaza, indicates something of interest at that location. The Palace of Governors (built in 1610) at the top and the Cathedral to the lower right look promising. One of the tourist websites says that Native Americans often have blankets on the sidewalks selling jewelry and art and there ought to be some good people watching there. The spots on Google’s map may not always be in the exact location, but are generally close enough—especially if there are a lot of them—to get you approximately where you want to be. Once I have a location or two, I’ll check Photographer’s Ephemeris for the best light. At Santa Fe Plaza, I see I can get both morning and evening light on the Palace of Governors. Meanwhile, off to the lower right is the Cathedral Basilica of St. Francis of Assisi. The sun will rise behind it, but the afternoon sun should light up its façade. With limited time, I might prefer to be here in the afternoon so I can shoot both locations in one outing. 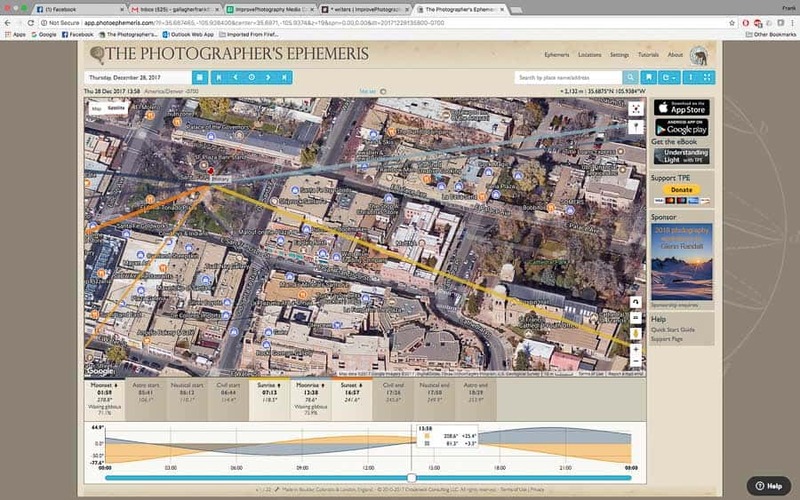 Using Photographers Ephemeris to check the best light for my planned shots. I’ll also use Photographer’s Ephemeris or PhotoPills to check on the phase of the moon during my visit. Wouldn’t want to miss an opportunity to have a full or crescent moon rising over a landmark! I will also do a Google image search of the city, as below with Santa Fe. Sometimes, I’ll see a photo that I really like and can learn more about the location by following the links. The San Miguel Chapel stood out as an interesting looking church. It’s right in the middle of the Barrio de Analco Historic District and across the street from the DeVargas Street House, one of the oldest houses in the country. It faces to the west and would be good with afternoon light. A little further down DeVargas Street are a bunch of art galleries. There should be some good shots in those neighborhoods! 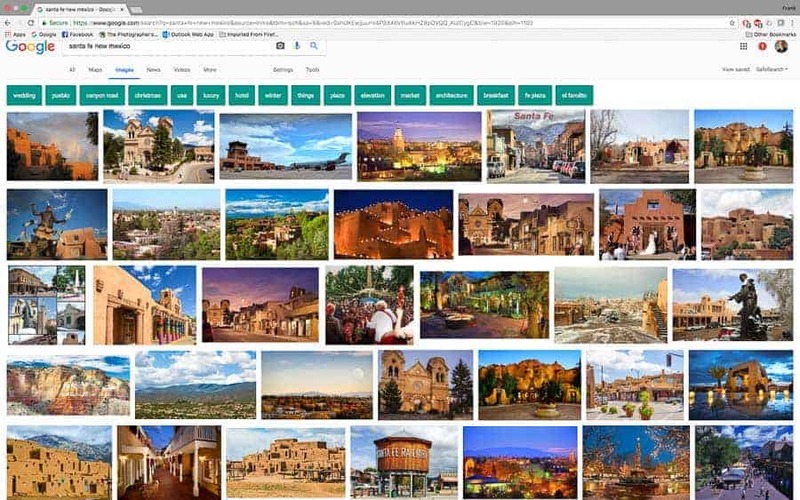 Screen shot of a Google Image search for Santa Fe. These tips will get you to many of the most popular views in a city, but don’t be afraid to wander through the streets. Yes, by all means shoot the typical, famous views and add them to your catalog, but then be alert for something different. Serendipity can net you some unique images. Often, my favorite photos from a trip come from my walks to or from a popular site. Now that I have all these great plans, how will I get around? The downtown looks pretty walkable but, if I’m short on time, what are my transportation options? According to the city website, there’s a free shuttle bus service around the downtown area. You’ll find that many cities have a free bus route through the commercial and/or tourist center of town. Santa Fe also has an extensive public bus system, and ride sharing options, like Uber and Lyft. And, of course, there are taxis. Plenty of choices to get around without renting a car! Where I live, and in many major cities, bike sharing is an option. You can sign up with your smart phone and rent basic bicycles by the hour from spots all over town, giving you another way to get around town that's faster than on foot, but still gives you the flexibility to stop whenever you see a composition. If you’re fortunate enough to have an extra day or two on your own, after your meetings, you can go farther afield. I’ll have two extra weekend days in Santa Fe. 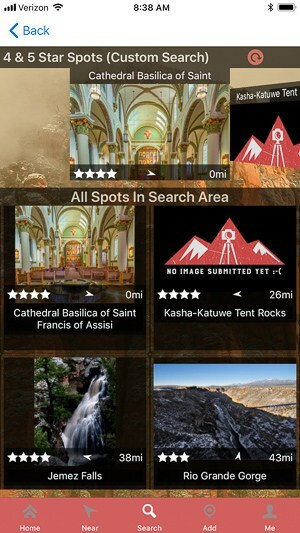 I already know I want to go to Taos, and I can use the same techniques to pre-scout locations there. The road to Taos is supposed to be lovely and both the old town and pueblo have many photographic possibilities. As with many historic sites where Native Americans are still living, there are restrictions on what you can photograph, you may need a camera permit and there is an entry fee. (Look up “Visiting Taos Pueblo,” for example.) When you're traveling, it's always a good idea to be familiar with the attitude locals have towards photographs. To some cultures, it's no big deal to be photographed. To others, it is an unwelcome intrusion. Better to know in advance! When I asked for recommendations on the Improve Photography Podcast Facebook group, Mark Franks pointed out that Ranchos de Taos is where Ansel Adams made a famous image of the back of an adobe church. The church sits just off the main road from Santa Fe to Taos, so I’ll definitely be stopping there! Now, where else to go? I’ll usually start by looking up National Parks and Monuments in the area, if any. Then I’ll follow that up with state parks in the area, to see if anything catches my eye. Many of these were also recommended by the Facebook group. Southeast of Santa Fe, I could go to Pecos National Historic Park, where there are the ruins of Pecos Pueblo, the remains of a 17th century Spanish mission, an old ranch and part of the Santa Fe Trail. To the west lies Bandelier National Monument, site of Native American structures dating from between 1150 and 1600 AD. There’s Hyde Memorial State Park to the northeast in the mountains, with a stream and waterfall, some hiking trails and a potential view overlooking Santa Fe. Another option is Kasha-Katuwe Tent Rocks National Monument, an area of unusual, tent-shaped formations formed by erosion. 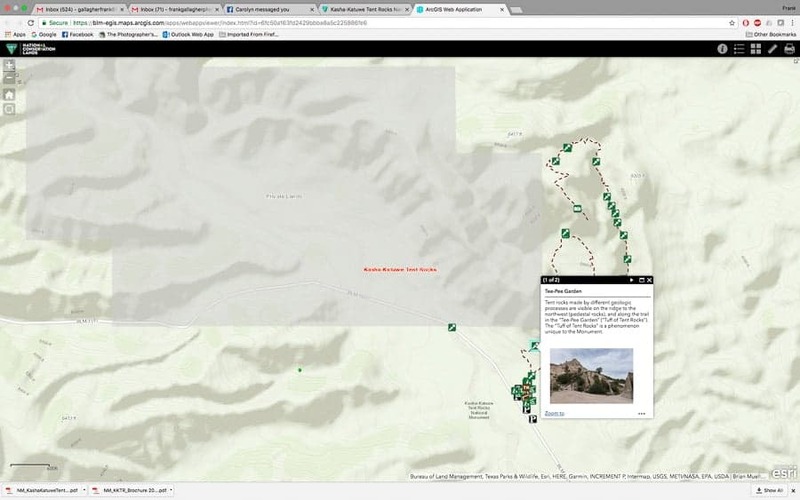 The Bureau of Land Management website for the Monument has an interactive map of the main area of the tent rocks which shows a variety of scenic options along two short (1.3 mile) trails. Or, I could spend more time wandering the streets of Santa Fe. As with so many cities, there is no shortage of photographic opportunities. All you need is some free time and a plan. My plans for photography in Santa Fe are coming together. I’ve got several places and times prioritized and a lot of potential places in the queue for any free time I may have. How do you plan for photography time when you’re traveling for work or with family? What are your favorite tips?